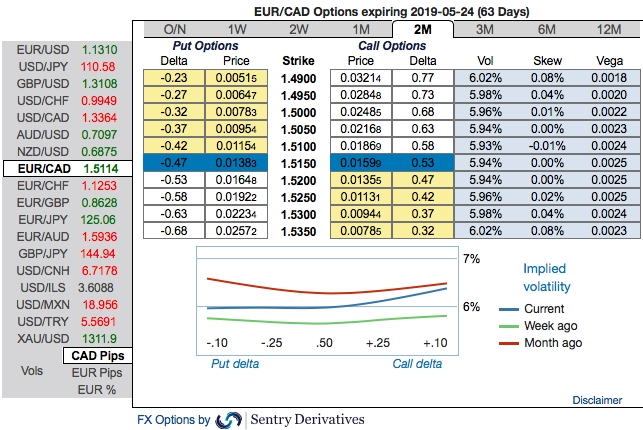 EURCAD OTC outlook: The measures of implied CAD volatility are dipping and the cost of hedging against CAD strength in the near term is sizing higher. The one-year risk reversal is at levels last seen in June 2017. But as a reminder that CAD seasonals typically run bearish in the medium terms. Despite the Canadian CPI and eurozone PMIs data announcement, the EURCAD implied volatilities have been on the lower side, ranging between 5.86% - 6.61% across all tenors. Please be noted that the IV skews of 2w/2m tenors have been well balanced on either side but more bias towards upside risks. The positively skewed IVs are stretched on both OTM calls and OTM put options, the underlying movement with lower IVs can offer economical OTM option pricing. EURCAD has spiked 0.92%, bounced from the lows of 1.4920 to the current 1.5113 level, but dipped in the previous months from the highs of 1.5634 to the lows of 1.4876 levels. But further material upside risks from the current levels will likely only come on a gradual basis given the BoC’s dovish rhetoric sees in upcoming monetary policy. Contemplating above factors, at spot reference: 1.5113 levels, although it is sensed that all chances of CAD may look superior over euro in the near-term future; it is wise to initiate balanced-hedging strategies but slightly in favor of CAD’s appreciation in the near-term through below recommendations. Hence, buy 2 lots of 2m at the money delta call option and simultaneously, buy at the money put options of 2w tenors. It involves buying a number of ATM puts and double the number of calls. Please be noted that the option strap is more of the customized version of options combination and more bullish version of the common straddle. As we are inclined to a directional positions, alternatively on hedging grounds ahead of data announcements of eurozone PMIs for manufacturing and service sectors and CPI numbers from Canadian side, we advocate initiating shorts in EURCAD futures contracts of April’19 delivery as downside risks are foreseen and simultaneously, add longs of May’19 delivery for the further major downtrend. Thereby, one can directionally position in their FX exposures. The directional implementation of the same trading theme by further allow for a correlation-induced discount in the options trading also if you choose strikes appropriately. Currency Strength Index: FxWirePro's hourly EUR spot index is flashing at 42 (which is bullish), while hourly CAD spot index was at -82 (bearish) at 05:33 GMT.